The hive will have less bees inside because most older bees are out foraging. Don’t use perfume, hairspray, sweet smelling cosmetics or shampoo before approaching the hive. ADDITIONAL ADVICE: Don’t eat bananas before inspection. – When a bee stings, she releases an odor – an alarm - pheromone that smells like bananas. This pheromone attracts other bees, signaling to them to defend the hive. So, it is not good idea to show up smelling like banana. If you need to wear a full suit in order to calm your nerves, do it. If you have decided you don’t need protective gear at all - veil is strongly recommended. Stings on the face are painful, and stings on the eyes or ears result in permanent injury. The natural predators like BEARS are dark and fuzzy so you want to avoid looking like them. Wearing light color clothing is good idea. Work from behind the main entrance. ADDITIONAL ADVICE: Don’t OVERSTAY your welcome!. Do your business and get out! Slow, deliberate movements. Don’t bang things around. Bees are sensitive to vibrations. ADDITIONAL ADVICE: LISTEN! If the humming becomes louder, the bees are getting upset and it’s time to finish the inspection. 7. NO SWATTING UNDER ANY CIRCUMSTANCES!!! Yes, your natural reaction to insects flying around your face is to wave them away with your hands, but if you do this you will agitate your bees very quickly. ADDITIONAL ADVICE: Watch out where you put your hands at all time! Bees are wild "animals" and they can defend themselves very efficiently. Honeybees will initially attempt to chase off the offender. If the offender does not leave, and the bee feels that itself or its colony has a life threatening risk, they will respond by stinging. Because after the stinging, the bee dies, it is only done as a last resort. 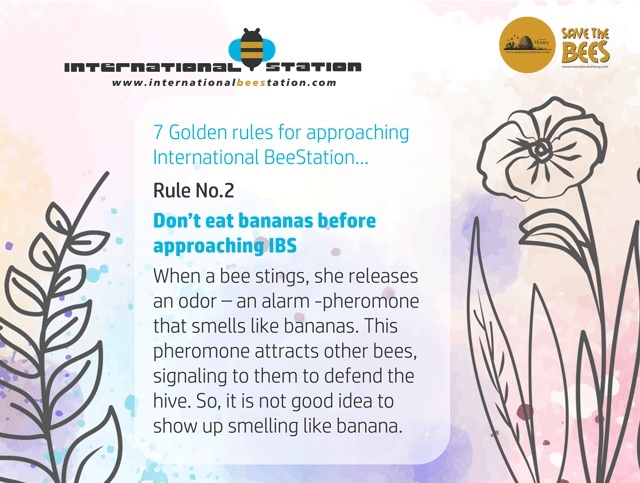 As National winners in Europe Start Up Awards 2017 in category climate, We want to welcome you to be part of a first of its kind, the International Bee Station. Just as the International Space Station serves as a home where crews of astronauts live in space, to help and improve the extent of human knowledge. We want to create a station where International supporters and fans from the whole world will be with us on the Mission to fight bee decline and make our planet great again!